Persistence Market Research has observed various opportunities in the wound cleanser products market. Penetration of wound care therapies in the emerging economies including Asia-Pacific and MEA is still not prevalent, as compared to North America and Europe. This is a result of low awareness regarding advance wound management and associated risk factors amongst the general and diabetic population leading to low assessment of diseases. Also, these countries are loaded with relatively large population base and incidence rates of various chronic wounds, such as diabetic foot ulcers, venous leg ulcers and pressure ulcers, are comparatively higher than that in other countries. As a result countries such as Japan, China and India are the target geographies for established wound care product manufacturers. The retail e-commerce channel has recorded significant attraction of consumers in the last few years, and is expected to show solid gain over the forecast period. In 2016, the sales increased four times the sale of 2015 due to increased adoption of online purchasing. The sale of wound care products through the e-commerce channel has also increased in the last few years, where the ecommerce companies are providing attractive discounts to their customers. Beside that leading manufacturers of wound cleanser products are also collaborating with the e-commerce sales channel, such as Walmart, Walgreen, Amazon and E-bay, to promote their sales. These abovementioned factors will create absolute opportunities for the growth of wound cleanser products market. 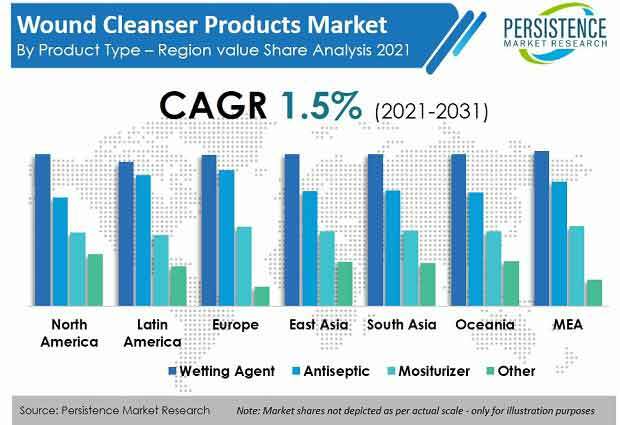 Persistence Market Research has assessed various aspects of the wound cleanser products market and has included historic data, current market scenario as well as future market projections in its recent research report. According to the global wound cleanser products market research report, the global market is expected to grow at a CAGR of 3.2% throughout the period of forecast, 2017-2025. The market in 2017 reflects a valuation of around US$ 1.5 Bn and is expected to reach a value of more than US$ 1.9 Bn by the end of the year of assessment (2025). Wetting agents segment in the product type category is expected to largely contribute to the valuation of the wound cleaner products market during the assessment period. In 2016, this segment lead the global market with respect to value and is likely to do so in the coming years. This segment is anticipated to grow at a slow rate to register a CAGR of 2.8% during the forecast period to reach a value a bit under US$ 750 Mn by the end of the year of assessment from a value of around US$ 590 Mn in 2017. Wetting agents segment is further classified into normal saline solution sub segment and potable and sterile water sub segment. Of these, the normal saline solution sub segment is the most lucrative and is expected to grow at a comparatively faster pace with a high valuation during the assessment period. This segment has largely pushed the market dynamics of the wetting agents parent segment. Moisturizers segment by product type category is anticipated to grow at a significant rate in the coming years. This segment is projected to grow at a high CAGR of 4.0% throughout the period of forecast. In 2017, this segment is valued at around US$ 286 Mn and is estimated to reach value more than US$ 390 Mn by the end of the year of assessment.